Moshe Rynecki was a Warsaw based artist who painted scenes of the Polish Jewish community in the interwar years. 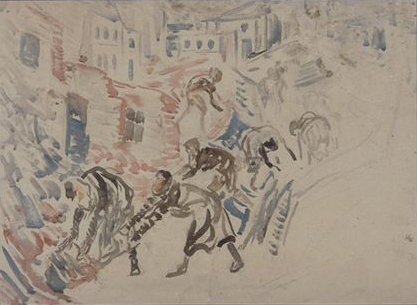 He had a keen eye for exploring and documenting the daily rhythm of life; painting scenes from the synagogue, manual labor, and leisure time. At the outbreak of the Second World War Moshe became concerned about preserving his life’s work. In the early days of the war he made the decision to divide his oeuvre of approximately 800 works into a number of bundles, and to hide them in and around Warsaw. He gave a list of the locations where the works were hidden to his wife, son, and daughter, in hopes that after the war the family would retrieve the bundles and the collection would be whole once again. Moshe perished in the Holocaust. After the war his surviving widow recovered only a small percentage of the original collection; just over 100 paintings. Today his great-granddaughter is searching for the lost and missing pieces from the original collection. To date she has located approximately 70 pieces. I grew up in the shadow of my great-grandfather’s paintings. Many pieces hung on the walls of my parents’ home which, given the sheer number of works, sometimes made my childhood home feel an awful lot like the hallowed halls of a museum. While the presence of the art sometimes made me feel more like I lived in an exhibition than a child-friendly home with play spaces, I had the distinct advantage of actually living in the space. There were no crowds, no closing times, and no security guards objecting to my close proximity to the works. The disadvantage, if there was one, centered around my having to learn about the art on my own. There was no curator to group the works by theme, style, or other artistic attributes, and never any exhibit labels to contextualize or explain the paintings to me. In a way, having paintings hanging with no written guidance is liberating. In fact, today it has become hip for some museums to not provide any information at all about the works on display. The theoretical concept for this lack of labels is to liberate visitors from a curator’s preconceived notions; to allow viewers to assess and appreciate the aesthetic appeal of a given piece (or a larger collection) without the wisdom and insight of titles or explanatory paragraphs. My parents were not ahead of their time, of course; very few, if any, private collectors have descriptive labels on their collection. Instead, guests notice the art on display and sometimes inquire about it. The family learns to curate the work verbally – to share the pieces they love and to tell abbreviated stories about the collection. This approach works quite well if the art is in your family and isn’t shared beyond the walls of your home, but as interest in my great-grandfather’s work has grown, and my responsibility to the collection has expanded, the haphazard titles assigned to the pieces gnaws at me. Many of the titles my family uses for the Moshe Rynecki pieces in our possession are ones that were created by my grandpa George. These were titles used for an exhibit in Dallas, Texas in the early 1950s and at the 1981 exhibit of Moshe’s work at the Judah L. Magnes show in Berkeley, California. Although it is plausible that my grandpa George knew how his father referred to the works, I have always been uncomfortable using these titles. They are not particularly insightful and, because the titles all come from a secondary source (from the family, but not the artist himself), I question their validity. Held by the Rynecki family. What I wish I’d said is that it hardly matters what the piece is titled. I don’t mean that in a snide or obnoxious way, I just think the work should engage people on its own terms and ought to be the focus of discussion. Ideally a title, unless it’s meant to be ironic or challenging, shouldn’t radically change the way a work is experienced. But of course it often does; a title is often assumed to be the artist’s conception of a piece, and thus a starting point for interpretation. Without going too far down the road of semiotics, it is a name, a quintessence, summarizing the piece for easy conceptual and linguistic reference. Of course it can be overstated, but there is definitely power in a name, and I am the first to admit that I always read labels at museums. I like insight and direction from curators about what to look at, how to see the piece, and why I should care about it. And so while I personally understand the desire for titles that communicate subject matter and convey context, I struggle with my choices on the matter as the family curator: Maintain consistency and use the titles established by my grandpa George? Re-write the titles that seem confusing and make up titles for all the untitled pieces? Or should I simply get rid of all the titles and refer to them by an inventory number system instead? So I find myself somewhere in between wanting to preserve the titles used in previous exhibits, and naming the remaining untitled pieces in a way that is consistent with the ones already in use. But my conundrum is how to do this in a way that is respectful to the history of the collection and how to do so in a “voice” that doesn’t call attention to the fact that a 21st century great-granddaughter has created the titles. It is a difficult balancing act, with hazards I know all too well from one experiment in trying to thematically label untitled pieces. Once, on the Moshe Rynecki: Portrait of a Life Facebook page, I posted three previously untitled paintings that all appeared to characterize the same scene, with a suggestion that they were about “the giving of Mishloach Manot” (the mitzvah of giving baskets of food and drink at Purim). I wasn’t quite sure how I would distinguish between the three pieces, which is a complication in itself, but in my mind they were tentatively titled under a general category, and I could work out details of distinguishing them later. Unfortunately, within an hour of my posting, someone posted that my categorization was incorrect- the paintings didn’t have the distinctive common elements one would associate with Purim, such as costumes, a reading of the book of Esther (known as a Megillah reading), or the like. If I had not gotten that feedback, it was likely my naming choice might have done more to confuse viewers than to enlighten them. I think it is possible that these works do depict a ceremony taking place during Purim, but looking at them carefully, and with the benefit of outside input, I’m not sure how likely it is. They could be portraying any number of situations. Like many historical works, a lot of key context has been lost already. My solution was to simply remove the title and, again, put off a cohesive strategy about giving the untitled works titles. Held by the Jewish Historical Institute in Warsaw, Poland. Another piece of the puzzle is what I know about titles my great-grandfather may have used. Clearly, I never knew my great-grandfather; he perished 25 years before I was born. Although I do not have a catalog from my great-grandfather with titles of all his works, it seems certain he named at least some of his works – those that would be in the public eye. Until fairly recently I had no idea what those might have been, but last October I discovered several newspaper articles from the interwar years containing published photos of his pieces with titles. It was a revelation slightly dampened by the fact that the newspaper clipping with the most titles was in German. 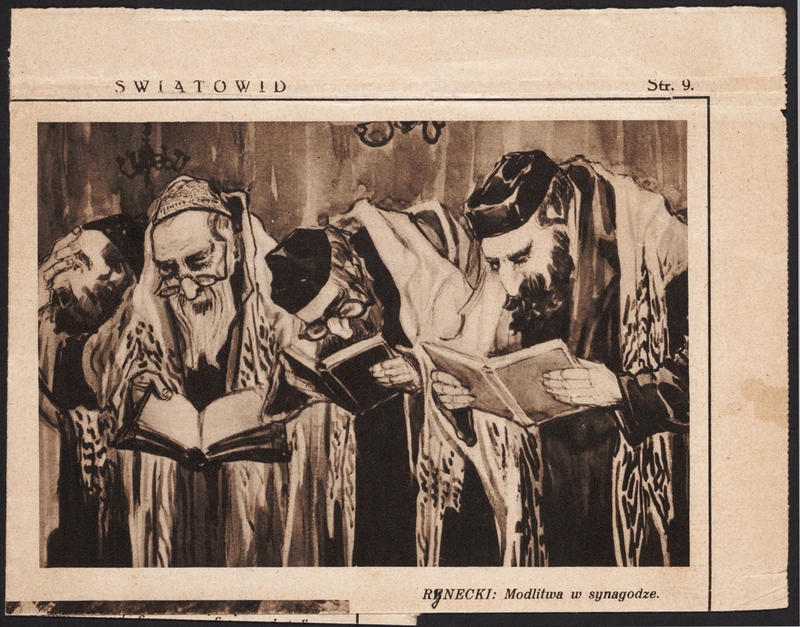 There was only one piece with a title in his native Polish: Modlitwa w synagodze, which translates to “Prayer in the synagogue.” [photo of newspaper clipping courtesy of the Thomas Fisher Rare Book Library, University of Toronto. The whereabouts of this painting are unknown and it may have been destroyed in WW2] From this and some of the possibly translated German titles, I can get a tiny glimpse of the relatively Spartan style of the titles my great grandfather used. Newspaper clipping held by the Thomas Fisher Rare Book Library, University of Toronto. The whereabouts of the painting are unknown. On the positive side, a simple descriptive title scheme is, at least in theory, fairly straightforward. On the negative side, a simple title such as this offers only the barest hint of a starting point for contextualizing or understanding the painting. A relative who has far more knowledge about Jewish religious practices than I, explained to me that this painting is not just a prayer. Rather, there are visual clues that offer insights about the scene. For starters, the men are wearing talliot (prayer shawls), but not tefflin (small black leather boxes containing scrolls of parchment inscribed with verses from the Torah, worn by observant Jews during weekday morning prayers), so we can conclude this is a Shabbat morning prayer service rather than a daily morning or evening service. We see three men focused on their prayer books, and one covering his eyes because he must be reciting the shema, a prayer which calls for the covering of the eyes to emphasize and focus the recitation of the act of listening which is called out in the prayer: Sh’ma Yis’ra’eil Adonai Eloheinu Adonai echad. Hear, Israel, the Lord is our God, the Lord is One. But of course only one man in this painting is covering his eyes – perhaps this is artistic license or perhaps it reflects the fact that the men are at slightly different places in the recitation of the prayers. So if this is the shema, why not title it as such? Or why not, Shabbat morning prayers? I’d really like a title to be as informative as possible while remaining concise, and so I wish I had more definitive information or a more descriptive title to work with, rather than just this fragment I have as a starting point. This is perhaps a trickier than a scene of people at work, since religious scenes are often of special significance, but there are potential interpretation issues for dozens of the pieces. One quote in my grandpa George’s memoir [Surviving Hitler in Poland: One Jew’s Story] stands out in adding further to my feeling of responsibility for titling or even describing the works. George wrote in his memoir about the accuracy in his father’s paintings, stating, “He, of course, would never make a mistake in his works because he knew the true way of wearing the proper paraphernalia… He never used photography, at this time almost non-existent, and had to memorize scenes, mostly the ones in synagogues or small houses of prayer where he couldn’t even use his pencil and sketch book.” My great-grandfather worked very hard to be precise and truthful in his portrayal of the Jewish community and I feel I can do no less in sharing his work three generations later, though much of the context has vanished in the interim. In part because of my academic background, and in larger part due to my sense of responsibility to avoid mistakes and communicate effectively on his behalf, I often get stuck agonizing over details, trying to find the best, most plausible, most informed interpretations from which to construct a succinct title. This explains why, despite my strong feelings that the works need descriptive titles, my efforts in that direction have stalled and there remain a substantial number of untitled pieces in our collection. 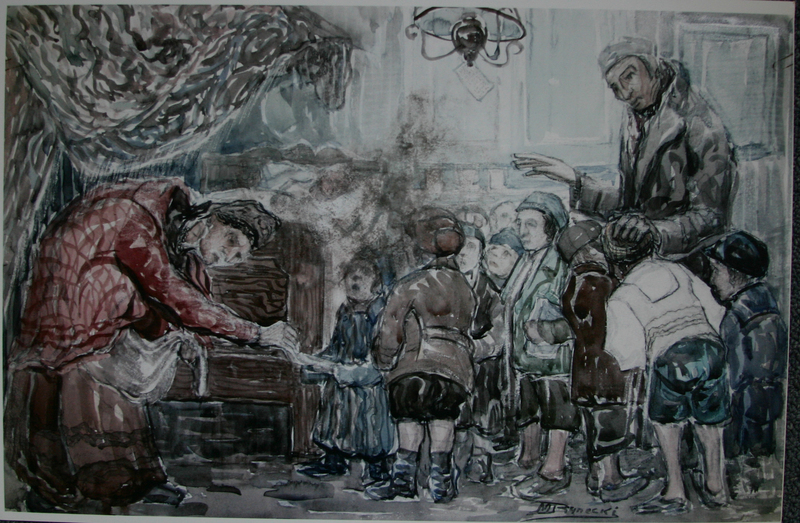 Elizabeth is Moshe Rynecki’s great-granddaughter. She has a BA in Rhetoric from Bates College (’91) and an MA in Rhetoric and Speech Communication from UC Davis (’94). Her Master’s thesis focused on children of Holocaust survivors. Elizabeth is passionate about sharing her great-grandfather’s paintings with others. To this end she is working on the Chasing Portraits documentary film project as well as a book about her family’s efforts to preserve her great-grandfather’s story and oeuvre of work.